Tell us about yourself! Where are you from? What kind of work have you done? Do you have any hobbies? My name is Saba Alamoudi. I am from Mecca, Saudi Arabia. The holy city for Muslims and one of the oldest cities in the world. It’s a crossroads and melting pot of many world cultures. People come to this city from many places around the world every year. I was born in Makkah and lived in this city for my whole life, and I got my bachelor’s degree in Arabic literature from Umm Alqura University in the same city. After I graduated, I tried to find a job there related to my major, but I did not find anything. I decided to apply for a scholarship through the Saudi government to come to the U.S. I came to the U.S in 2012 and I started learning English. I was planning to teach Arabic as a second language and the LTS program was the perfect program for me to achieve this goal. Therefore, I decided to apply. I have tutored Arabic learners and lead the Arabic circle in the Mills International Center when I was an English learner in the AEI. I also was involved in many activities to introduce Arabic culture to American and international students through the Saudi and Muslim Students’ Association of the UO. After I enrolled to the LTS program, I got a job as a language instructor in Umm Alqura university in my hometown, which I will start after I graduate from the LTS program. Could you tell us about any internships or GE positions you had at the UO? I did an internship to work with Arabic instructors at the UO in some Arabic language classes that focused on teaching modern standard Arabic and the Egyptian dialect. It was a great experience for me. I learned from the teacher a lot of things related to teaching Arabic in an EFL context with students speak the same native language. 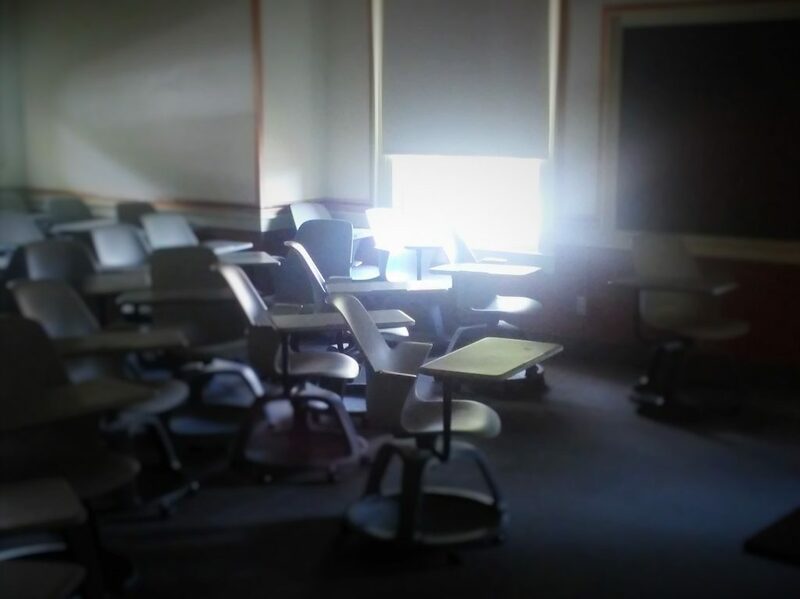 I got the chance to teach in these classes and I learned a lot from the experience such as managing class time. One big challenge was to teach Arabic by speaking English in the classroom. For example, explaining many grammar rules or explaining vocabulary meaning using the English language. 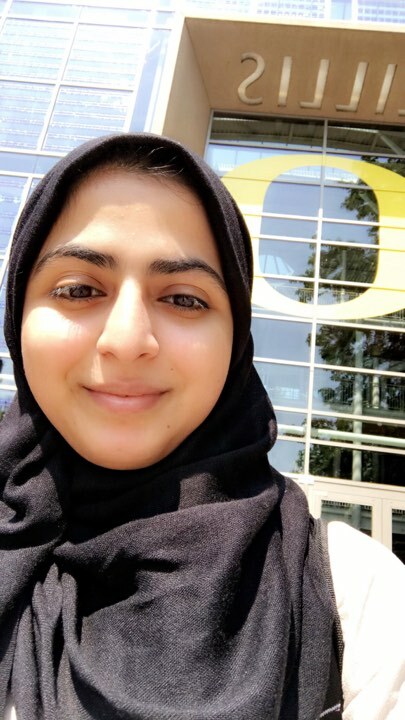 Arabic language classes in the UO helped me to realize the challenges that students face when they communicate and interact with native speakers. Arabic diglossia was the main challenge. The students were learning in most of their classes the Modern Standard Arabic which is used in very formal context such as academic context while native speakers use their own dialect to communicate with each other. The standard and the spoken languages are very different and it was hard for the students to understand native speakers when they speak. After spending some time helping students to realize the differences between the standard and the dialect, and after attending a Arabic class that focus on teaching the Egyptian dialect, I realized that the main difference is the pronunciation. That led to the focus on teaching pronunciation to clarify the problem of comprehensibility and intangibility in the communication between Arabic learner and native Arabic speakers. My Master’s project focuses on integrating teaching Pronunciation In Arabic curricula as a second language through some activities. I focus on both segmental and suprasegmental features for modern standard Arabic and the western Saudi dialect. My goal is to help students learn how to use what they’ve been learning in the modern standard Arabic language classes to interact and communicate with native speakers. Learning more about the differences in the the sound systems for both varieties of Arabic can help them avoid a lot of intelligibility and comprehensibility problems. What is the most valuable thing that you’ve learned during your time at the UO? 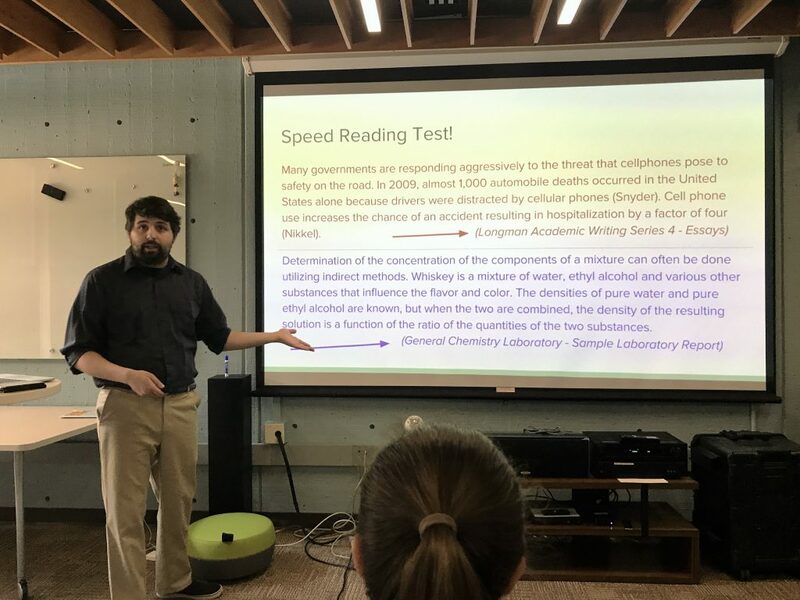 Professors at the UO, especially the LTS program, have different teaching styles than most professors in my country. One main valuable thing that I learned is how a great teacher should be. Other valuable things that I learned and appreciated during my time in the program are the teacher and peer feedback in the classroom, the classroom discussions, the microteaching activities and practice that I have had during my learning journey. It helped me to apply and experience a lot of things that I learned theoretically in the program, and it helped to shape my teaching perspective and style. Finally, I learned that language is more than vocabulary and grammar rules. Also, culture is always associated with learning languages; therefore, including pragmatic, sociolinguistic and suprasegmental aspects is very important to teaching a language effectively. My name is Iryna Zagoruyko and I am originally from Ukraine. I moved to the U.S. 5 years ago. I got my first Master’s degree in Business Administration in Ukraine. After graduation, I worked as a manager of foreign economic relations at the Korean International Company in the capital of Ukraine, Kyiv. Also, in Ukraine I worked as an Interpreter of English for foreign economic delegations. After I moved to the U.S., I worked as a student specialist in the ESL Department at Lane Community College in Eugene. After that, I did my second Master’s degree with the Russian, East European, and Eurasian Studies Department at UO, simultaneously teaching first- and second-year Russian courses as a GE for two years (2014-2016). Being a Russian GE really changed my life goals: I understood that language teaching is my passion and decided to receive more knowledge on that. Now I am a graduate student at the LTS program of the Linguistics Department of the UO, and plan to receive my third Masters’ degree in language teaching this Summer. This year was quite intense for me. Juggling being a graduate student in the intense LTS program, working at CASLS, and having a small baby (who was born three weeks after I started the LTS program) was quite a challenge. I did not manage to have a lot of free time for hobbies or interests and had to plan smartly to balance all aspects of my life. But every spare minute I have I try to spend with family: my baby and my husband. We really enjoy hiking together, going to the coast in Florence, and just being together at home. Could you tell us more about your GE position at UO? 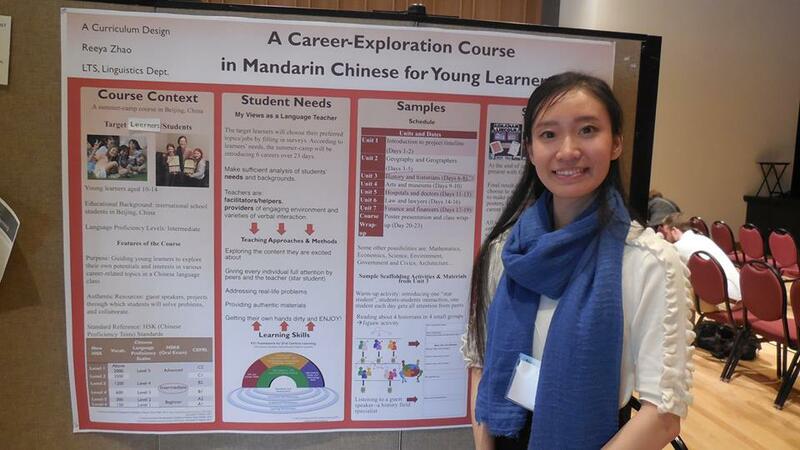 This year I was a graduate employee (GE) at CASLS (Center for Applied Second Language Studies) at UO. I worked on the Russian version of CASLS’ Bridging Project, a year-long hybrid course centered on exploring student identities. 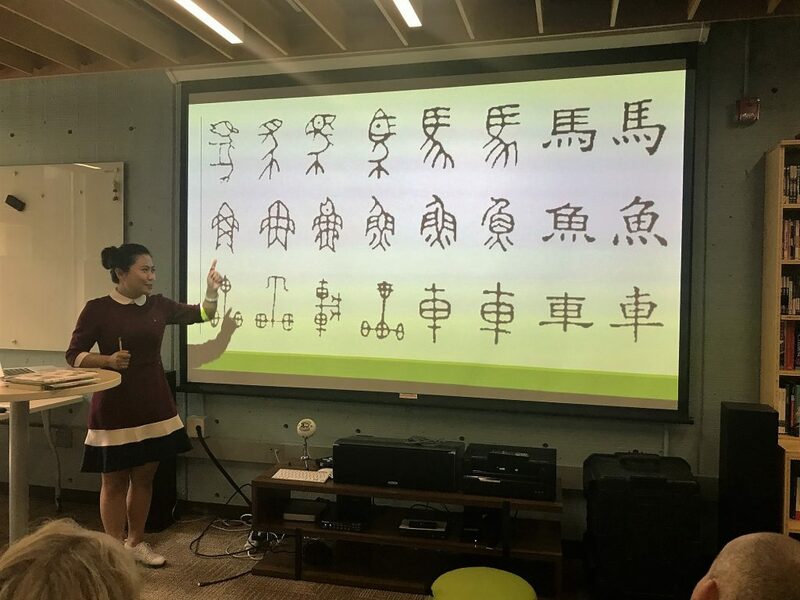 This project encourages students with high levels of proficiency, especially heritage students and those who graduate from immersion programs, to continue language study at the college level, which has become increasingly more challenging. CASLS is a great environment where people support and value each other. It was a big honor for me to work in such a highly-valued and highly-recognized National Foreign Language Resource Centers as CASLS. I truly believe that work which is done at CASLS will improve teaching and learning of world languages. My master’s project is called “Marching to Different Drummers: Differentiated Instruction for Teaching Mixed Classes of Heritage and Non-Heritage Learners of Russian with Motivation in Mind.” The motivation for this project is to offer language teachers access to the concepts of differentiated instruction, and strategies for applying it to their specific teaching context – mixed/homogeneous classes of heritage and non-heritage learners of Russian of novice to intermediate levels of proficiency. Probably, that we, LTS students, are all in a perfect place to gain very valuable knowledge on teaching which we can later apply in our lives. Professors in the LTS program possess extremely high levels of expertise in language teaching and offer us great support. Being a part of a single cohort of LTS students who are taking the same classes and doing the same projects together is really fun. Becky and Jeff at the banquet dinner and awards ceremony. 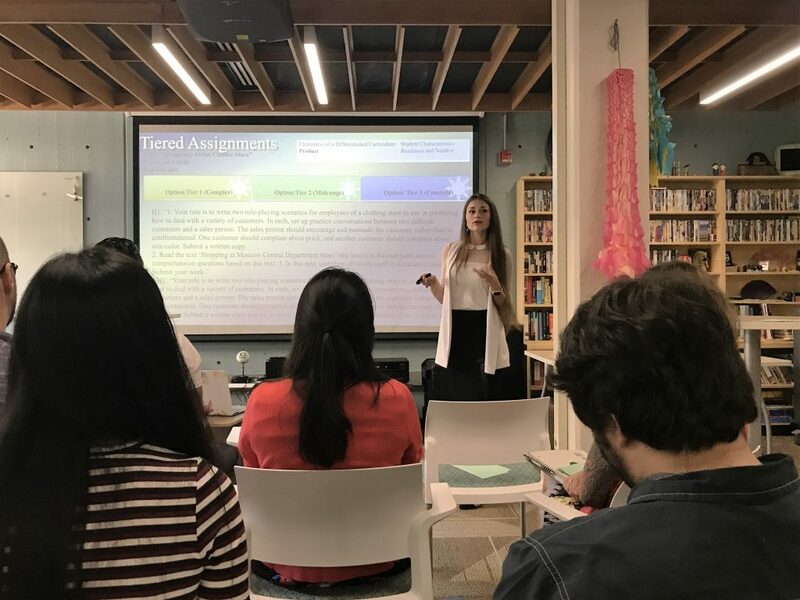 In addition to the many internship opportunities available to LTS students, there are also many opportunities for professional development in the field of language teaching! In March, several LTS students attended the 2017 TESOL Convention in Seattle, Washington, which was a great opportunity for them to learn new ideas from experienced teachers in the field. 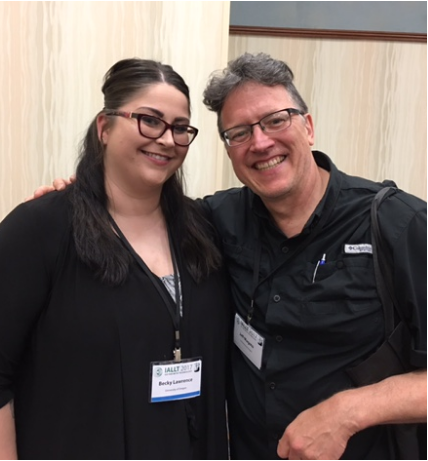 Becky Lawrence (2017 cohort) presented at TESOL Electronic Village, which was an amazing opportunity for her to share what she has been working on in the LTS program with other teachers. Becky also accompanied LTS faculty and Yamada Language Center director, Jeff Magoto, to the biennial 2017 International Association for Language Learning Technology (IALLT) conference held at Concordia College in Moorhead, Minnesota this past June. Jeff, also a longtime IALLT member, gave presentations about the Yamada Language Center and ANVILL. Becky gave a presentation about her MA project, which was great practice for the final MA presentations coming up in August. Fun fact! The 2019 IALLT Conference will be held in our very own American English Institute at the University of Oregon, hosted by Jeff Magoto himself! 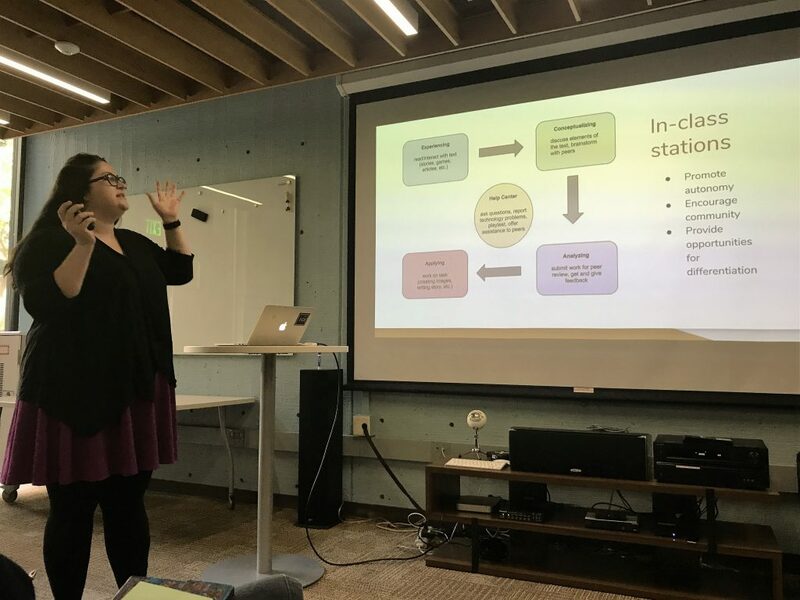 Because technology in language teaching is such a crucial part of the LTS program, IALLT is a great organization for LTS students. They provide a lot of support and opportunities for graduate students and new teachers to present at conferences and publish in their journals. The IALLT organization is very warm and welcoming. Despite not knowing anyone besides Jeff upon arriving, Becky left the conference with many new friends! For graduate students interested in attending IALLT conferences, IALLT also offers a $500 Ursula Williams Graduate Student Conference Grant to help pay for costs such as registration and housing. Becky was a recipient of this grant for the 2017 conference, and plans to stay involved in the organization to support graduate students in the future! TESOL and IALLT are just two of the organizations that LTS students can become a part of, whether to attend, present, or publish. 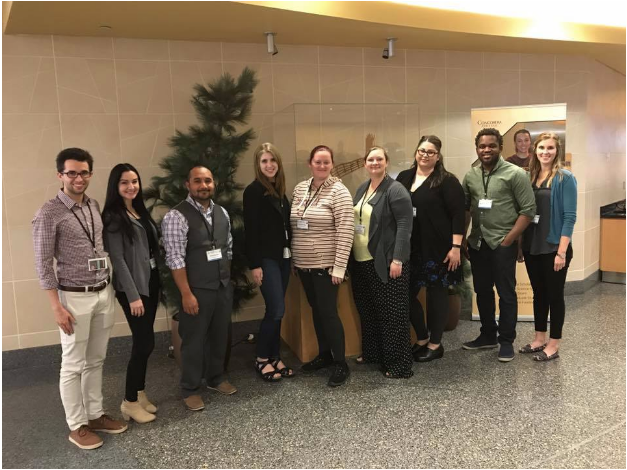 Several of the graduate students who attended IALLT with Dr. Amanda Romjue (center), a 2015 Ursula Williams Grant recipient and current graduate student mentor. Tell us about yourself! Where are you from? What work have you done? Any hobbies? I was born in Cheongju, South Korea, but when it was time to go to university, I moved to Seoul, and I lived there for almost ten years. I majored in Korean language and literature and journalism, and in my last year of university, I got the Korean language teaching version of a TEFL certificate at another university. After graduation, I started working teaching both Korean and English to speakers of other languages at a community welfare center and an NGO. I also worked in program administration managing language classes and tests at a university and at a couple foreign resource centers for the city of Seoul. During that time, I met my husband Chris, and we decided to move to America and apply for graduate schools. We spent almost nine months in Denver, Colorado before coming here to Eugene. I have quite a few hobbies. I really enjoy going to see movies in the theater. My favorite movies are horror movies and thrillers like the Korean movie The Wailing(곡성) or the original Texas Chainsaw Massacre, but I like romantic comedies too. I also like baking and cooking. I always find baking to be a good stress relief when school gets too stressful. Recently, I’ve also started gardening. This is the second year in a row that we planted a vegetable garden in our backyard. I’m surprised how well we can grow tomatoes and other vegetables in our garden. 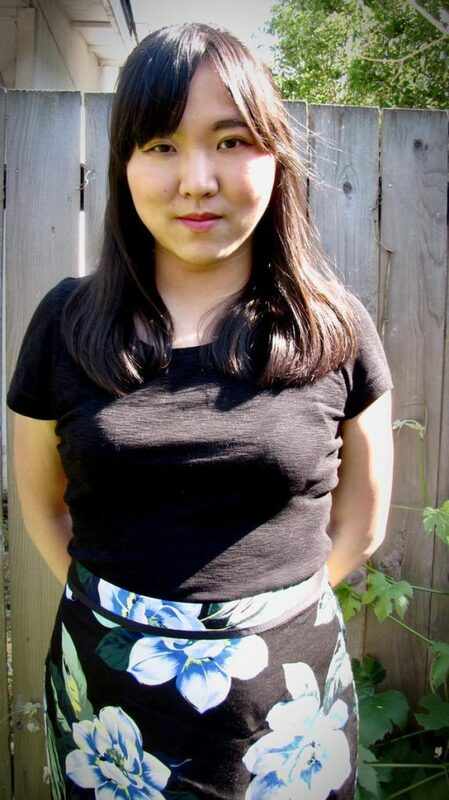 What was your experience being a Graduate Employee for the Korean department at the UO like? Being a GE at UO was a great experience. This was the first time that I was able to teach Korean outside of Korea, so working with the undergraduate students was a lot of fun. But, I have to say that being a student and a teacher at the same time is pretty challenging. I think the biggest challenge was adapting to a new student culture. To be honest, it was a bit intimidating at first. However, if I look back at my experience, I can see how the LTS program helped me improve my teaching ability and build my confidence over the two terms I was a GE. 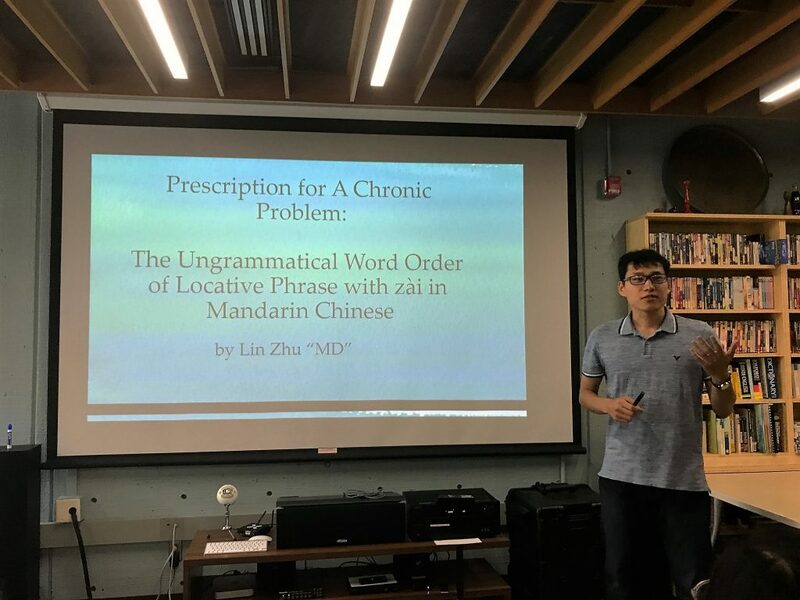 I learned a lot about second language teaching in my LTS courses, and I was able to use that information to help improve my teaching. 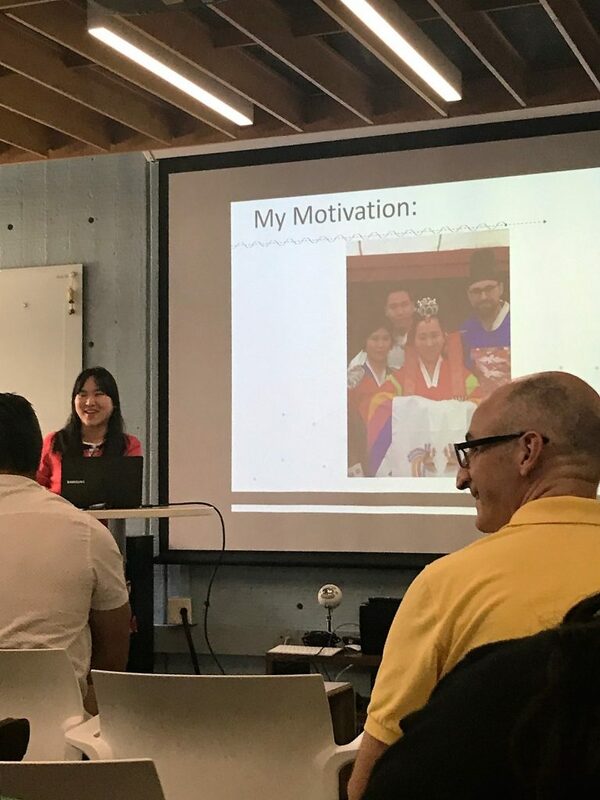 Also, the cohort and the faculty from both the LTS, and East Asian Languages and Literatures departments were really supportive and they gave me some good advice for some of the challenges I had while teaching. I still see my former students around campus or in Eugene, and they always politely say “hi (안녕하세요)” to me by bowing and speaking in Korean. I’m always impressed by their correct honorific usage and culturally appropriate behavior, so I can tell that they had a good GE teacher. 😉 I’m looking forward to teaching them in second year Korean this fall. Could you tell us a little bit about what you are focusing on for your Master’s project? Actually, I’m pretty busy right now because I’m working on both my MA project and a publication with Dr. Brown in the EALL department about Korean speech-style use in the marketplace. Luckily, I’ve been able to focus a lot of my LTS coursework on my MA project. For my MA project, I’m designing a Korean as a second language course for English-speaking husbands of Koreans living in Korea. When I got married to Chris, I saw that the language that he was learning in the textbook and in his Korean academy wasn’t really helping him communicate with my family or to perform daily tasks in Korean society. I belong to a forum of Korean women who are married to foreign spouses, and they often say similar things about their husbands. So, I found a need, and I’m designing my project to fulfill the need of teaching functional survival language skills and sociocultural competence for English-speaking husbands of Koreans. It’s a lot of fun to think about new ways to help the husbands learn about Korean family communication using problem-based learning. What is the most valuable thing you have learned since joining the LTS program? I can’t really say that something is the most valuable because I’ve learned a lot of valuable things in this program. Of course I’ve learned a lot of practical aspects about teaching language and about developing assessments and language courses, but I’ve also learned a lot about the purpose of a cohort. I wasn’t familiar with the cohort system until I came to UO, but I think the cohort is a really amazing thing because everyone is very supportive of each other. I’m pretty shy and introverted in general, but I’m amazed at how many people help me by giving me feedback on projects or assignments, or when I give presentations. Their support has helped me to build confidence in myself as a non-native English-speaking graduate student. Graduate school is hard, and I think it’s even harder as an international student because of the linguistic and cultural differences, especially for someone who hasn’t had experience studying in an English-speaking university like me. However, just by being in classes with the cohort makes me feel like we are all in it together, and it helps to motivate me to continue to work hard in my studies. 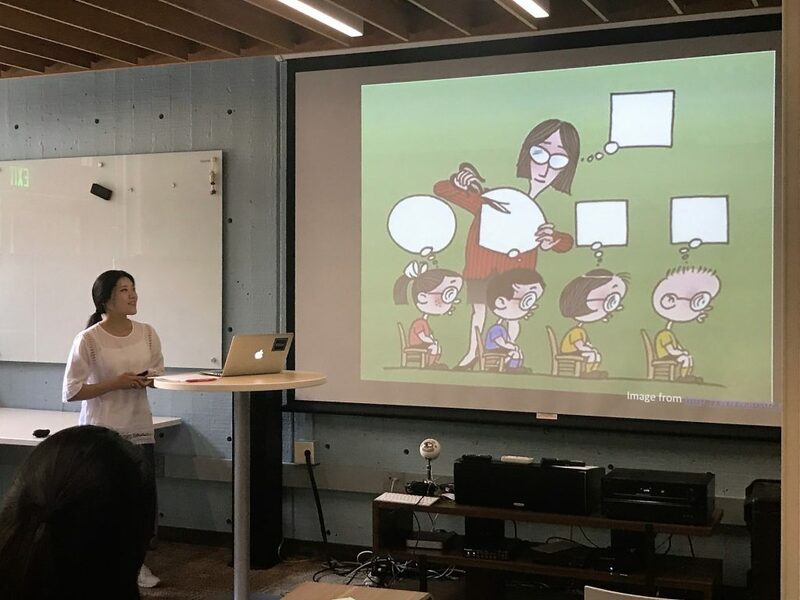 Also, the faculty has all been really kind and helpful, and I value how much they have supported my development as a Korean teacher, and in helping me find opportunities. 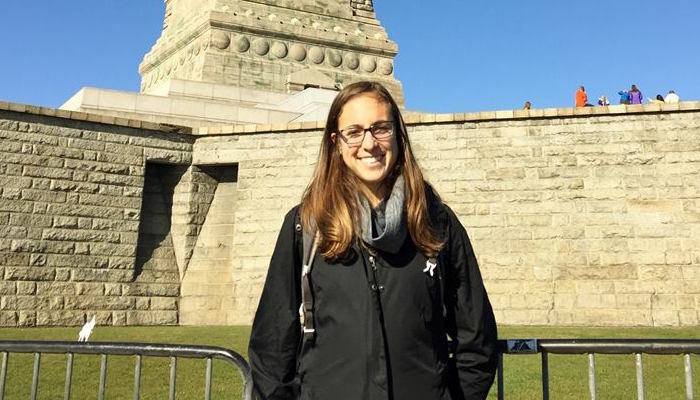 This end-of-term Student Spotlight is a special “goodbye” to our dear friends, colleagues, and classmates from the Fulbright Foreign Language Teaching Assistant Program. 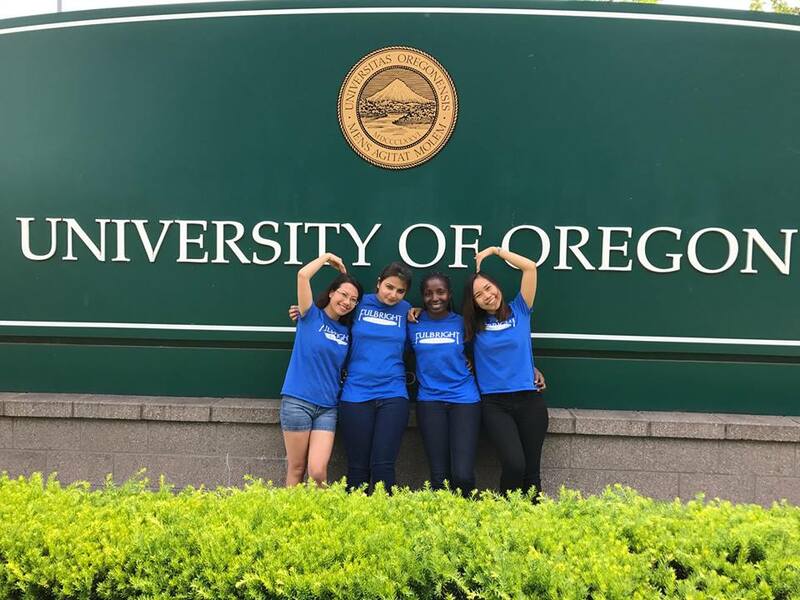 The Yamada Language Center at the University of Oregon has hosted these four lovely language teachers throughout the 2016-2017 school year, and the LTS cohort has had the wonderful opportunity to study along side them in the various Language Teaching courses they participated in. 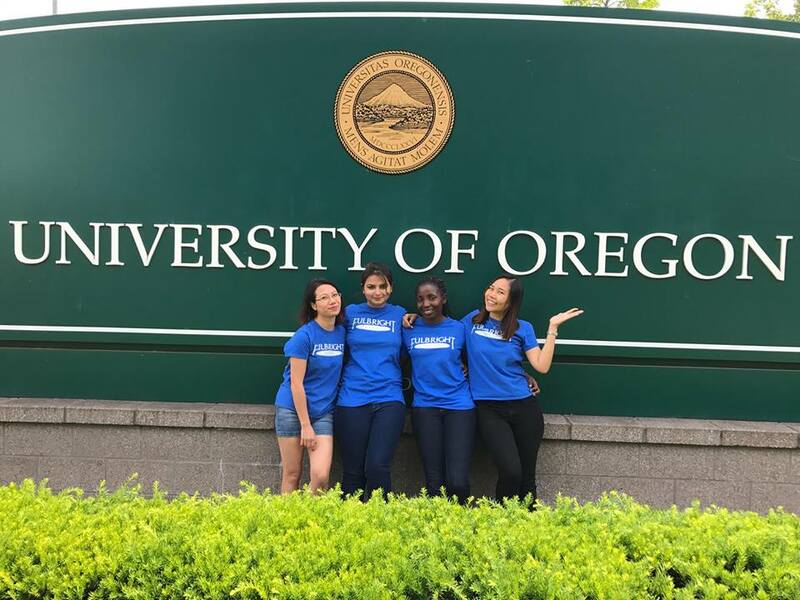 The YLC has been proud to welcome the FLTA’s without whom 4 of the 8 Self Study Program languages would not be available to the UO students and community. 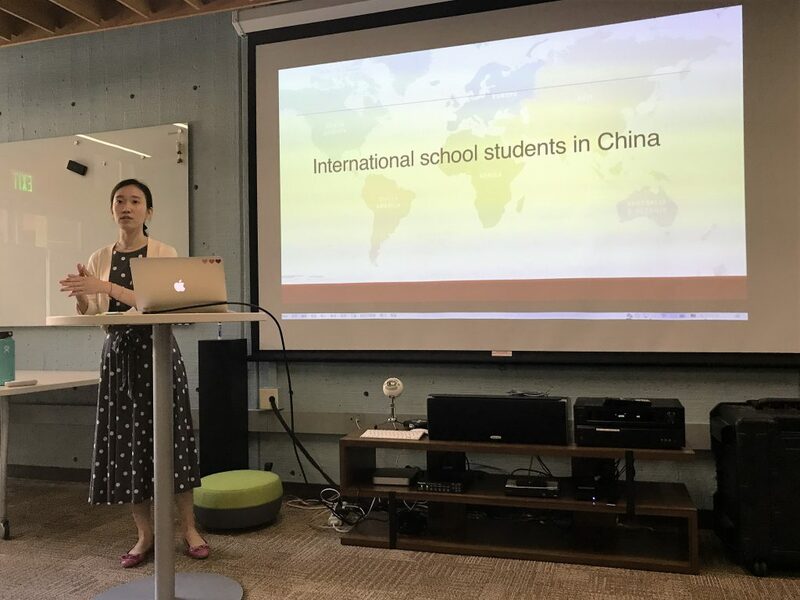 Now that Spring term is over, each scholar will soon be heading back to her home country, and the LTS program would like to recognize and remember the wonderful experiences we got to share with them! Tell us about yourselves! Where are you from? What kind of work have you done? Any hobbies? I am Anh Duong. I come from Hanoi, the capital city of Vietnam. I am an English instructor at the University of Languages and International Studies back in my home country. I was granted the Fulbright scholarship last year and came to UO to study and work as an FLTA. About my personal life; I love music, movies, traveling, reading, and taking pictures. Since I came here, I have taken up cubing, basketball, and playing the guitar as my new hobbies. I am from Hyderabad, Sindh, Pakistan. I work at the National University of Modern Languages (NUML), so currently I am on leave as I am availing the Fulbright Fellowship. I teach graduates and undergraduates majoring in English Literature and Linguistics. I like reading books, and writing critical reviews. I enjoy traveling, especially to the places which have had a rich history. My name is Irene Njenga, and I am from the central region of Kenya. I have a Bachelor’s Degree in Linguistics and a Master’s in Education, both from the University of Nairobi. 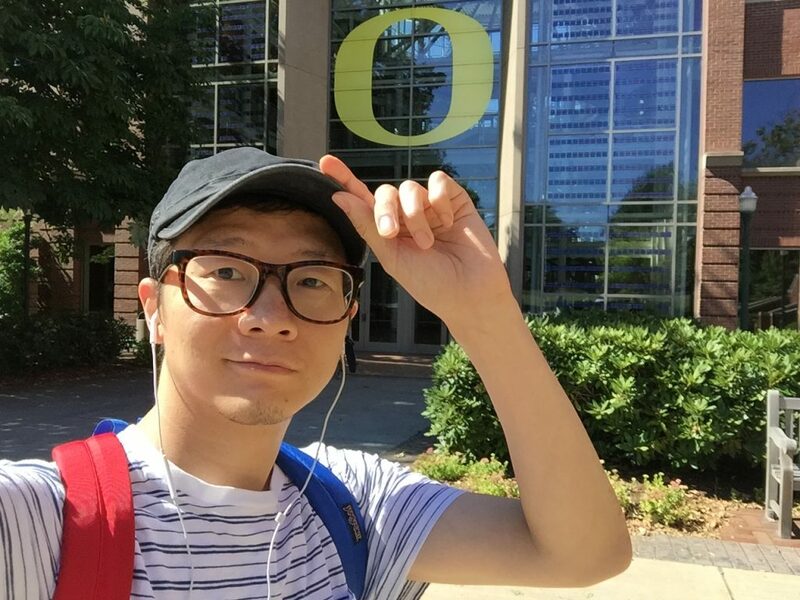 Before coming to UO, I had worked in two places. My first job was at Dadaab Refugee Camp (Kenya) as the officer in-charge of the Accelerated Learning Program, and my second job was as an English teacher at Mukurwe High School (Kenya). I enjoy traveling and socializing with people from different cultures because it opens my mind to new ways of thinking and stimulates my creative problem-solving skills. I also enjoy swimming, cooking, reading novels, listening to music and watching movies. My name is Suparada Eak-in. I am from Thailand. Back in Thailand, I worked as a lecturer of English in the Department of English and as a Deputy Director of the International Office at Mahanakorn University of Technology. My specialization is Teaching English as a Foreign Language and Teaching English for Specific Purposes. I taught EAP and ESP to non-English majors including Engineering, IT and Business students. In my free time, I like learning new languages, doing art and working out. Now, I am learning four languages: Korean, Japanese, Chinese and Vietnamese by myself. I also draw and take pictures. My favorite exercises are jogging, Thai boxing and yoga. Tell us about teaching at the UO as an FLTA! What is that like? One of my key missions in the US is to teach Vietnamese to both students at UO and community members at the YLC. I appreciate the chance to teach my native language and share Vietnamese culture with American people as well as heritage students. Thanks to the Self Study Program at YLC, with small-size classes but extensive interaction with students, I have precious opportunities to listen to many individual stories, enabling better understanding of American culture as well as my own culture. The YLC is the place to grow professionally, interdependently and culturally. I never taught Hindi/Urdu before coming to US, though it is the national language of Pakistan. I, being a native speaker, learned a lot about my culture, language and country by staying oceans away and that’s not only remarkable but a kind of liberating feeling. Although I have been teaching for one year before becoming part of YLC, participating in the program has provided me an insight to see language teaching not as a way to show how languages are different from one another, but as a platform to let me explore how languages all around the world are spoken in their natural, cultural and raw forms. So, in order to completely imbibe in this language teaching experience, I myself decided to learn a new language. I attended classes of Turkish. New language gives a new lens to view the world. As such it may seem that speaking different languages actually makes us different from one another but actually learning a new language makes one feel connected to the wider community which is not one’s own. In one place, where creating borders may divide us, but learning new languages can unite us, this is my takeaway from YLC. Swahili is one of the easiest languages to learn! Although a biased view, it is true that Swahili is not a tonal language, has a fixed stress pattern, and words are spelled exactly how they are pronounced i.e. no silent letters! Teaching Swahili at the UO has been very rewarding. It has also been a great opportunity to interact with new cultures and incorporate Swahili culture into language teaching. I believe that my students enjoyed the lessons and gained competence in using the language. This has also helped me refine my teaching skills and familiarity with using the communicative approach in teaching grammar. I never discussed grammar in a tabular form and very rarely used grammar technical terminology. Teaching Thai at YLC is different from teaching English at my university in Thailand. Firstly, YLC classes are small with no more than fifteen students. This provides me the opportunity to get to know my students more so I can facilitate their language learning more properly. Moreover, YLC offers the Self Study Program which places emphasis on the students’ needs. The challenge is to compromise/balance students’ individual needs and prepare the lessons to serve their needs efficiently. Lecture-based and commercial textbooks seem not to correspond with YLC students’ learning styles and goals. Thus, I mainly implemented a theme-based method in my classes. I set the themes according to the students’ needs and designed interactive activities to engage students in learning. I found that the students enjoyed learning and improved their skills proficiently. What classes did you take during your time at UO? Did you have any other projects that you worked on? What was the most valuable thing you’ve gained from your experience here? Apart from teaching Vietnamese, I also attended some classes, two of which were Teaching English Culture and Literature, and Testing and Assessment in the LTS Program. The most significant thing I took from these classes is the inspiration from my professors and classmates. I especially enjoy the lively and thought-provoking discussions with different points of view and practical projects in teaching that will benefit my own teaching in the future. I enrolled myself in three courses, one course per term. My grant with Fulbright ensures that I grow strong academically by taking the classes that can serve my long term goals. Therefore, I took classes in LTS all three terms; Teaching Culture & Literature in Language Classrooms, Teaching Pronunciation, & Teaching and Assessment. My time with LTS cohort is worth treasuring as I met intelligent and creative people from various parts of the world. I am also part of International Cultural Service Program (ICSP). 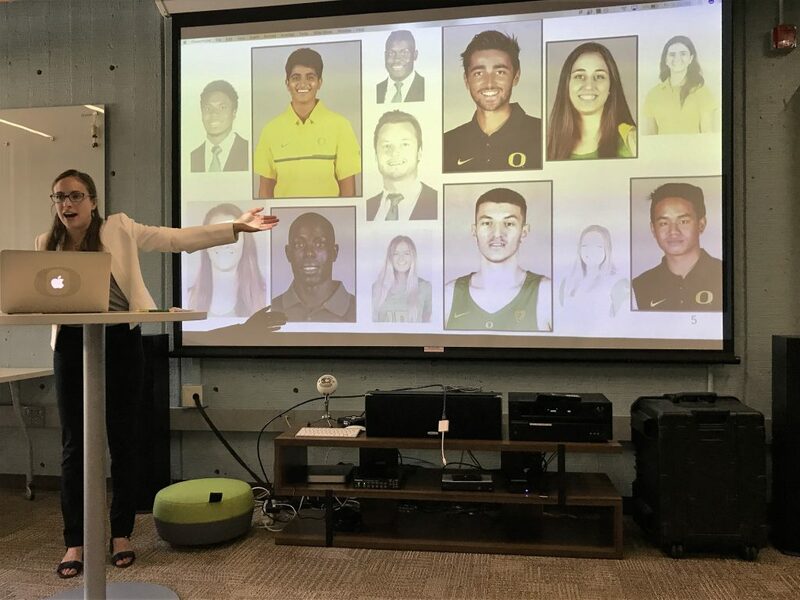 I presented all around Eugene in different high schools, facility centers, care systems, and at UO as well, as the cultural ambassador of Pakistan. From my entire year at UO, the most valuable asset that I have gained is to challenge the limits, and to outrun them. I took classes in Language Teaching and International Studies. I worked on various projects like incorporating literature into English language teaching, education and culture in Kenya, as well as creating direct types of assessment. The most valuable thing I have gained is that language teaching can be fun. I have learned how to use different scaffolding activities in teaching language, classroom management techniques, key assessment principles, and skills in creating and/or adopting assessment tools and procedures for the language classroom. I took two classes in LTS and one class in Linguistics. The classes in both programs provided me knowledge that I can apply in my teaching career. My favorite class was Teaching Pronunciation, which I took last term. I like this class most because I did not only learn the contents but also had opportunities to practice. Besides, I like observing the techniques that Dr. Patricia Pashby used in class. I found those techniques useful and worked well with my students. Apart from teaching and learning, I worked as a cultural ambassador in the ICSP at UO. I presented Thailand and Thai culture to school students and senior communities in Eugene. It is a great opportunity to meet and talk with local people outside of the university and have productive cultural exchanges. Any plans for the future, or final thoughts you would like to share? My gratitude goes to the Fulbright program for giving me a chance to come to the US, meet amazing people, and share my story. When I go back to Pakistan, I will resume my teaching, but there will be entirely different teaching methodologies. I will be working on making classes more student-centered where students should take responsibility of their learning. I learned a lot about testing and assessment this last term, and it has completely changed my perception towards language teaching. I am really looking forward to using the new teaching and testing trends which can ensure learning for not just a fleeting moment but for a life-time. “If you can’t fly then run, if you can’t run then walk, if you can’t walk then crawl, but whatever you do you have to keep moving forward.” Martin Luther King Jr. I believe that despite the obstacles we face when pursuing our dreams, we should always be focused and keep working to realize them. All of these experiences make me eager to go back and share them with my colleagues and students back home. I also want to better develop teaching methodology and education in my home country. Tell us about yourself! Where are you from? What previous work have you done? Any hobbies? I hail from Portland, Oregon but enjoyed a well-spent six years in Boulder, Colorado during which I completed an M.A. in Comparative Literature. I have worked as a Spanish-English bilingual legal assistant for an immigration attorney, coffee slinger, mentor to at-risk Bolivian youth, aerobics instructor at a home for the elderly in Cuba, writing tutor, and freelance editor. My hobbies include playing Lt. Commander Geordi La Forge in Eugene’s local Trek Theatre, rock climbing, laughing wildly, and going to fellow LTS-er Dan White’s UO Rubik’s Cube club. Tell us about your work with NILI and learning Ichishkíin! Far more than a hobby has been my involvement with the Northwest Indian Language Institute (NILI) at the University of Oregon and learning the PCNW language Ichishkíin. It has been and is a privilege to both collaborate there and learn the language. While 25 languages were once spoken in Oregon and 25 in Washington, only one indigenous language class is available at UO. However, NILI supports many Native community members in their efforts towards self-determination and language revitalization. 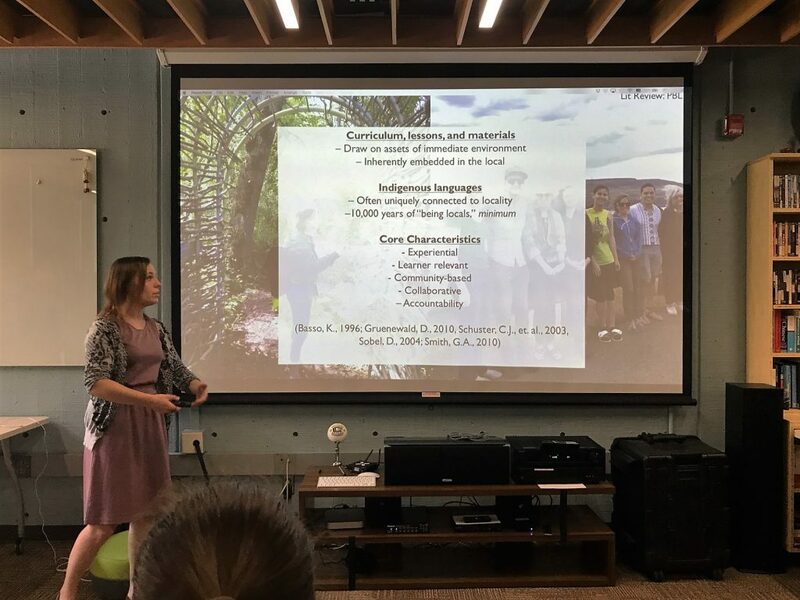 Collaborating there, through internships (from archiving Klamath-Modoc materials to creating mini-lessons for our Ichishkíin classroom), being an Ichishkíin student, and volunteering at the annual two-week Summer Institute has meant supporting those efforts. Tell us a little bit about your Master’s project! 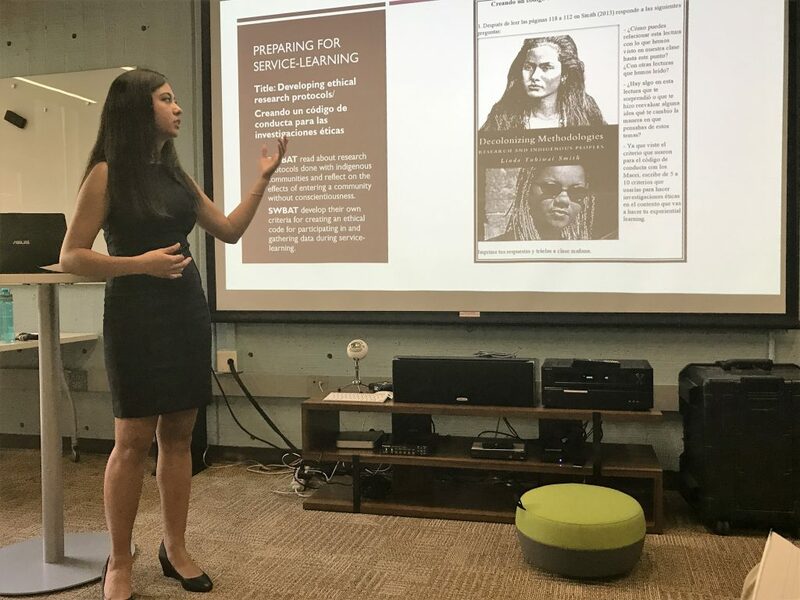 During the Summer Institute, teacher training happens for Native community members, as well as curriculum and materials development and other educational related endeavors in classrooms and events. I have participated in Lushootseed classrooms and mapping workshops. The latter led by LTS instructor and NILI Associate Director of Educational Technology Robert Elliott; my own final MA project has morphed into a relatedly inspired project with him as my advisor. I will be using ideas ranging from paper map creation to cyber-cartography to adapt existing Ichishkíin materials into new ones. This both fulfills the mission of creating new materials for language use in the spirit of the Ichishkíin classes I have taken, as well as repurposing existing materials that contain indispensable language knowledge provided by first speakers. These materials will be either teacher created, designed to be student created, or teacher created yet student manipulated. What is the most valuable thing about the LTS program for you up until this point? 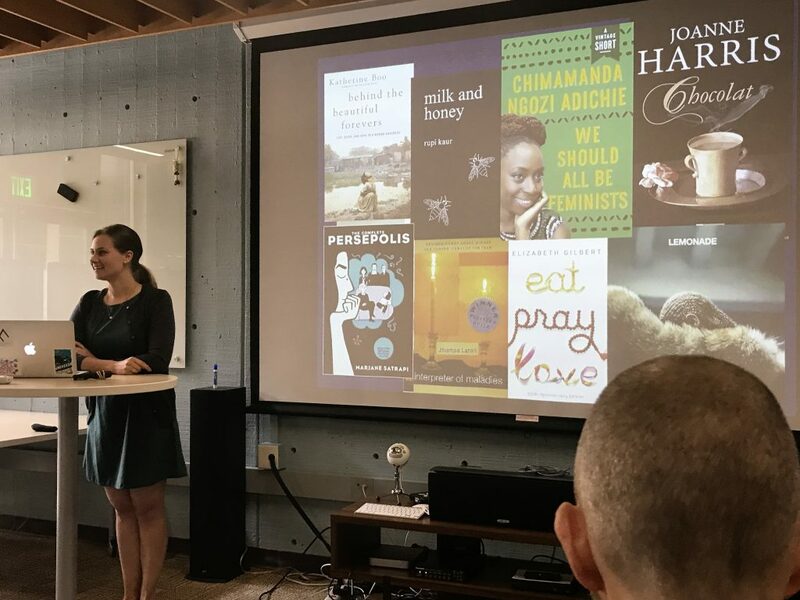 These NILI & Ichishkíin based experiences have blended richly, poignantly, and distinctively with my other work during the LTS program (including an internship at the American English Institute), as many of the pedagogical circumstances are unique and require accordingly unique approaches and considerations. This is where place-related learning and everyday-relevant language learning became fulcrum to my internal gravitation towards effective, hands-on, collaborative, experiential, and multidisciplinary educational frameworks and experiences. For me, the most valuable part of LTS has been precisely this co-habitation of the typical program route and my experiences with NILI. I am deeply grateful for both. Tell us a little bit about yourself. Where are you from? What is your previous experience before coming to UO? Any hobbies? Etc. I was born and raised in Casstown, Ohio. It is a small farming town that topped out at 267 people at the last Census. I guess an updated stat would be 266. I earned a Bachelor’s degree in French and Linguistics at Ohio’s first university, Ohio University (Go Bobcats!). 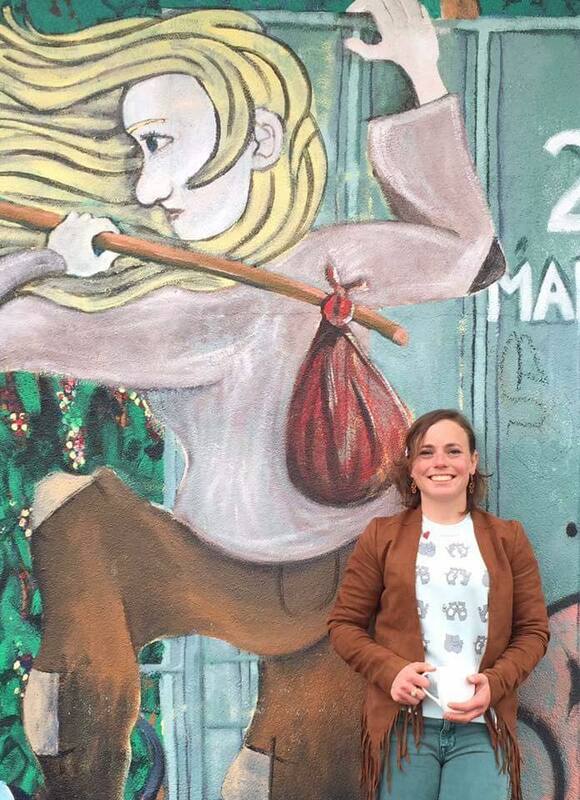 My time in Athens is where my interest in language learning and teaching was cultivated. To date, I have more experience being a language learner than a language teacher. In 2012, I studied abroad in Avignon, France. After the term finished, I moved to Saint-Marcel-les-Sauzet and was a WWOOFer at a bed and breakfast. (WWOOF is an acronym for the organization, World Wide Opportunities on Organic Farmers, and a WWOOFer is someone who volunteers their time at an organic farm or the like in exchange for room and board). I was learning French in the wild. It was exhilarating. So much so that I returned in 2014 for a second stay. Although I didn’t know it at the time, WWOOFing really helped inform my philosophy on language teaching & learning. I know that you are a GE at the Jaqua Center. Could you tell us what that is like? Yes, I’d love to! I’m the Writing Learning Assistant Graduate Employee for the Services for Student Athletes department. I tutor student athletes taking writing courses or courses with a heavy writing component. 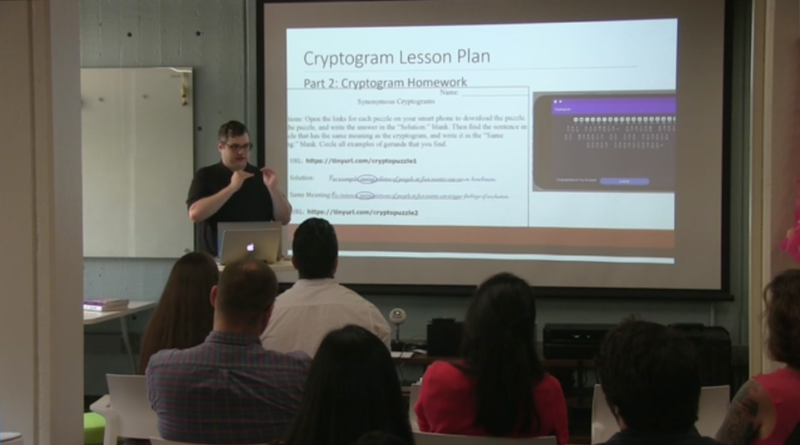 One of the perks about this position is that I get to bring what we learn in the LTS program with me to work. In addition to working with athletes in writing courses, I also tutor many of our international student athletes helping them with schoolwork and developing their English language skills. Working with the SSA staff and student athletes has been a really fun and rewarding part of graduate school. I love learning about each student’s story and, more importantly, watching it be written in real time. Different from teaching, I often work with students for several terms, which allows time to observe academic and athletic growth. What is the most valuable aspect of the LTS program as you’ve experienced it thus far? One aspect has been the opportunity to work collaboratively with fellow classmates. 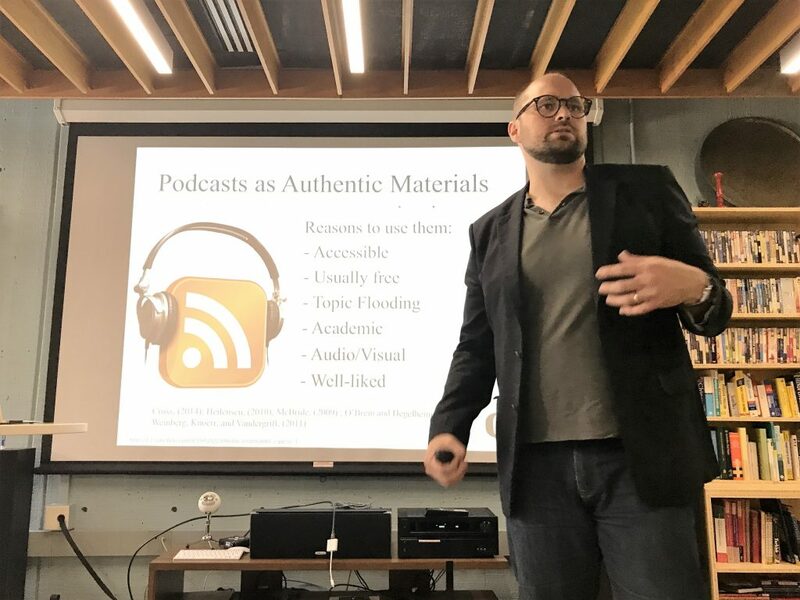 I’m a hands-on learner, so the opportunity to get our hands dirty with material, concepts, and teaching techniques has been very helpful.